The story associated with Navratri and Durga Puja is found in the Markandeya Purana. 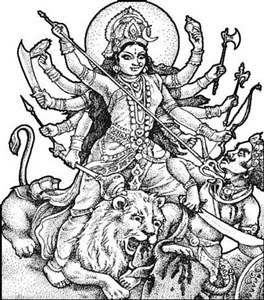 The chapters 81 to 93 in the Markandeya Purana talks about the slaying of demon Mahishasura or Mahisha by Durga and it is referred as Devi Mahatmya and is recited during the Navratri and Durga Puja. It symbolized the victory of good over evil. In 2019, Navratri begins on September 29 and ends on October 8. Devi Mahatmya extols the greatness of Durga in 700 hymns grouped into 537 sections and therefore it is also known as Durga Saptashati. It details the exploits of the goddess in her three major forms: Kali, Lakshmi and Saraswati, representing the three fold energy: strength, wealth and wisdom. The most famous episode is Durga killing Mahishasura. Legend has it that two sons of Danu called Rambha and Karambha performed penances to gain more powers. Rambha performed the austerities by standing amidst five ritual fires called Panchagni and Karambha by standing in neck-deep in water. Indra, the lord of the gods, felt threatened by such intense austerities and took the form of a crocodile and killed Karamba. Rambha, who came to know about his brother’s death, increased the intensity of his austerities and won several boons from gods like great brilliance, beauty, invincibility in war. Most importantly, the boon that he will not be killed by humans or Gods or Asuras (demons). After receiving the boon, he was roaming in the garden of Yaksha and there he fell in love with a female-buffalo. To express his love Rambha took the form of a male-buffalo and copulated with the she-buffalo. But soon a real male buffalo discovered Rambha in the garden and killed him. Rambha’s inflated ego made him not to ask the boon of invincibility from animals. And an animal happened to be the reason for his death. The female-buffalo, who was pregnant, decided to kill herself in the funeral pyre of Rambha. She jumped into the pyre and from the pyre sprang up a mighty asura (demon) with the head of a buffalo and human body. This was Mahishasura. Mahishasura defeated the gods and the demons. He attacked the heaven and captured it and made ‘devas’ his slaves. He proclaimed that he is now Indra – the lord of the gods. The gods led by Brahma approached Vishnu and Shiva and appraised them of the situation. The actions of Mahishasura caused intense anger in the Trimurtis. The anger emerging out of Brahma, Vishnu and Shiva combined to the take the shape of a terrible form and this was Durga. It is said that the flames of fire that gushed out of the eyes of the Trimurtis – Brahma, Vishnu and Shiva – formed a mountain, brilliant like a million suns. Out of this mountain, Durga took shape as the goddess more powerful than all the gods. ‘samasta devanam tejo rasi samudbhavam’ Durga is the brilliance of all the gods. Captivated by the awe-inspiring Durga, the gods bestowed on her their own characteristic weapons. Shiva – the trident, Vishnu – the discus, Varuna – the conch, Agni – the spear, Yama – the cudgel, Vayu – the bow, Surya – the arrows, Indra – the vajra, Kubera – the mace, Brahma – the water pot, Kala – the sword and Vishwakarma – the axe. Himavan gifted a mountain lion as her vehicle. When the goddess was seen by Mahishasura, he fell in love with her and sought to marry her. The goddess promised to marry him, if he defeated her in the battle. A terrible combat ensued and continued for nine days. 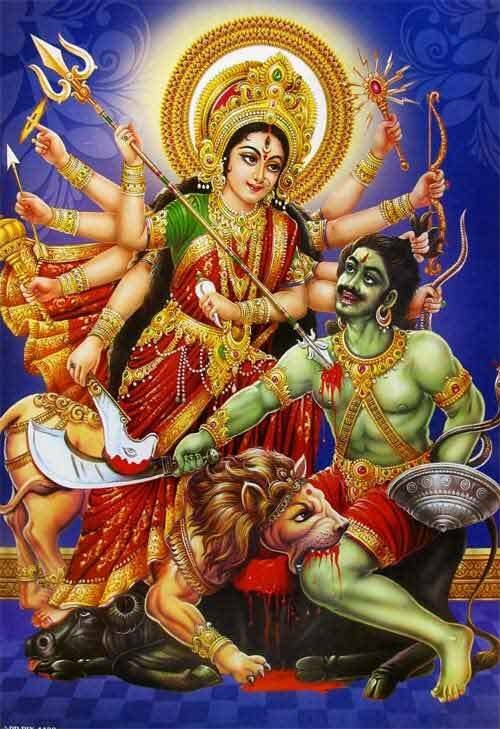 Finally, Durga assumed the terrifying form of Chandika and pinned Mahishasura down with her foot and pierced his neck with her spear and she cut his head off with her sword. The legend about the killing of Mahisha is found in many Puranas and therefore there are slight variations in the story. The story is also found in Vamana Purana, Varaha Purana, Shiva Purana, Skanda Purana, Devi Bhagavatam and Kalika Purana.